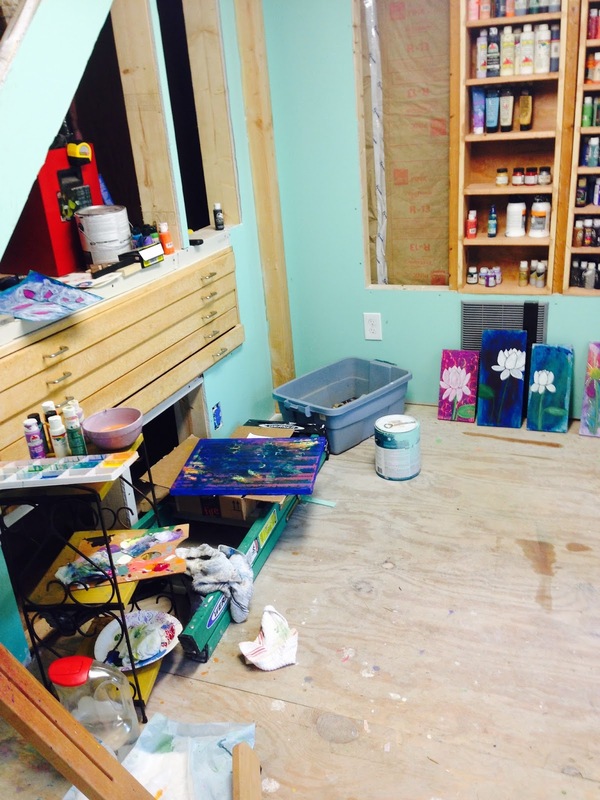 we started creating my studio last summer, demo-ing and rebuilding the old cellar so it would hold the New England weather at bay, and we are finally at the stage where i can create in it. i use the term loosely, though, as i am limited to the art supplies i have brought down. i am full of faith that this room will be completed before this christmas. until then i have to laugh at the state of turmoil around me as i create. and i am thrilled that my dedication to my art is big enough to deal with the spiders that still linger, the sawdust and drywall dust, and just the lack of tranquility that i would like around me as i do my thing. i turn on some tunes and today sprayed some lavender misting spray to get some of the funkiness out. i do what i can with what i have at this time. 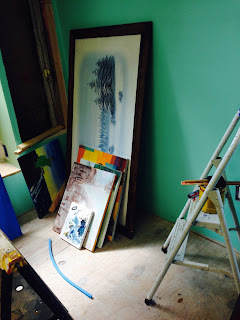 and am happy i have any studio, even in this state. the biggest purchase we still have to buy and install is the flooring. i think after that is down, i will be bringing most everything i want to down! i could care less about trim, but it might help keep the spider population down somewhat. maybe. i hope. to the left is my easel. 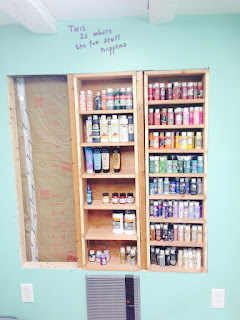 i use a small metal shelf for the paints i am using on my current canvas. the drawers hold stencils and mark-makers (i will have a more in-depth post about where supplies live when it's all finished). 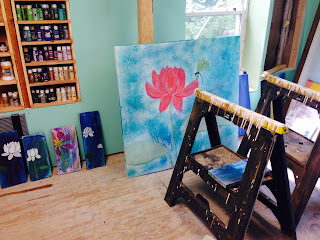 i use any surface i can to hold canvasses as they dry and await another layer. this is my awesome paint shelving! i'm so excited about these, as i can search a shelf easily to get the right color. as you can see one is pending, but i can use these well enough. saw horses from staining the paint shelves have come in handy for drying canvasses, so i have not taken them out of my room yet. 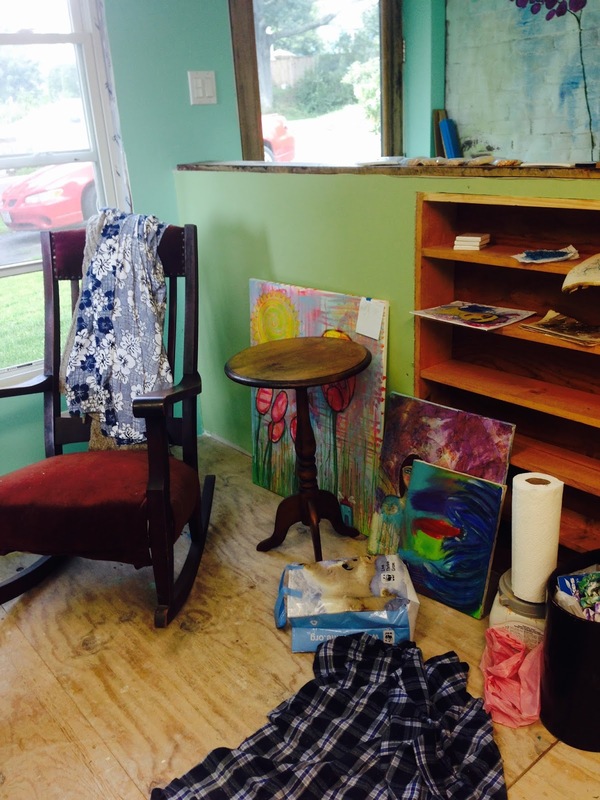 again, any area can get used as canvas holding areas. 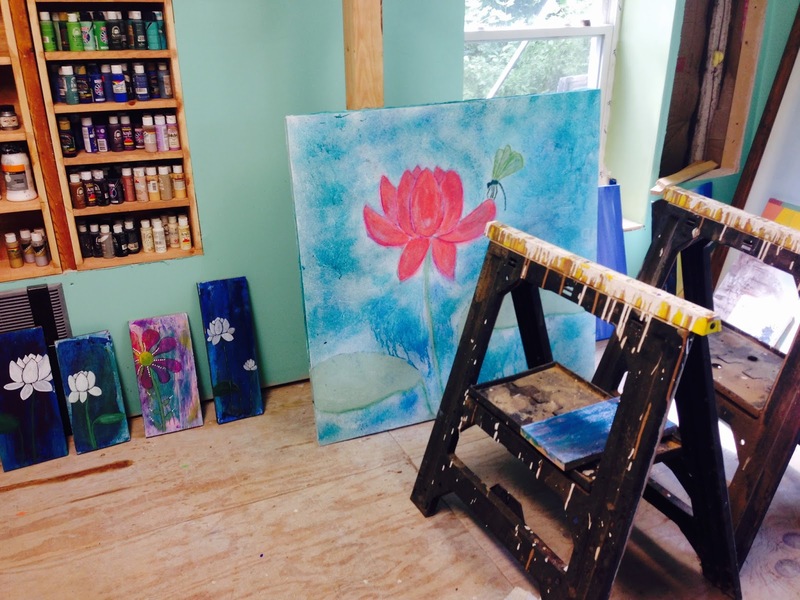 the big lotus and dragonfly is about to transfer upstairs in the next few days. 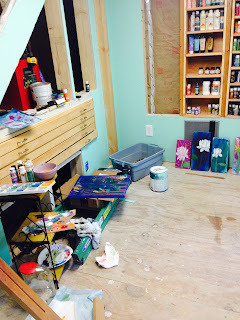 right now this area is for pre-loved canvasses i have yet to work on. soon it will be for my blogging/bookwork/beadwork desk. there will be another built in shelving unit of some sort in the corner. my spot to meditate, read, chill. the blanket on the floor is for the pup to lay down at my feet, but he'd rather lay in the sawdust instead, when its available. good doggie. 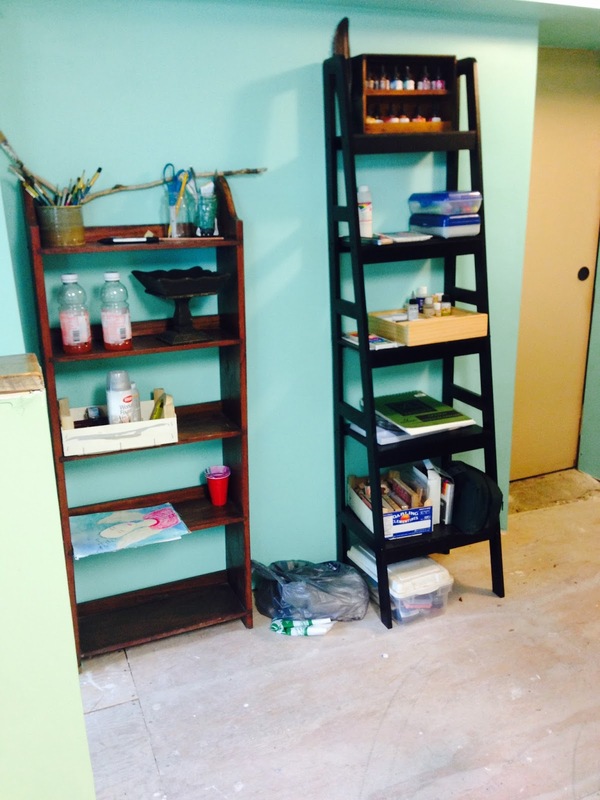 the shelving here is for beads and other such items. 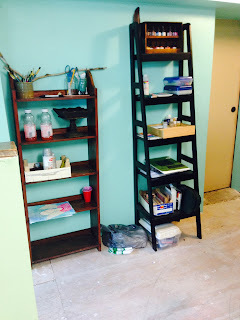 and on the other side of the half wall that creates the hallway to go from the cellar proper to the side yard i have storage for india inks, paint brushes, pencils, rubber stamps... these shelves fit nicely there and don't seem to be in the way of the big lumbering men who do man type things in the tool room beyond my studio, so they will stay there. their contents will probably change, but they work well for these tools now. and, there we have it! my space where the fun stuff happens! i will update with more news when it happens!